Our youngest volunteer, Lizzi, shares about giving up her time to work with us. I first came to Brighton and Hove City Mission way back in June 2014, and have volunteered on an on/off basis ever since. In these mere three years, this charity seeking to serve the City, Church and Christ has undergone huge transformation and change to become a more effective and engaging service. I have had the great pleasure of seeing this, whilst observing how the core values are upheld as derived from their Christian beliefs. The three key components to this charity: Schools’ work, the Food Bank and Rest Homes work together as part of an integral system to serve the most vulnerable people in the Brighton area. The Schools’ Team deliver a wide-ranging and diverse programme of assemblies, training days and prayer spaces, in order to encourage young children in their Spiritual Development through linking it to Christianity. My favourite aspect of this team would have to be their work involving prayer spaces, as it is a brilliant way of facilitating an interest in faith and beliefs whilst catching a glimpse of the Kingdom perspective from the eyes of a young child. Similarly, the Rest Homes Team endeavour to place worth and value upon every elderly person through collective worship and services held in nursing homes across the city. Despite the fact that this work can be challenging at times, it reinforces the pleasure and privilege that it is to encourage and uplift the older members of our community. Far too often, the elderly are disregarded within our society, yet the City Mission aims to reverse this commonly-held belief by placing value upon every individual that they encounter. I love the change in atmosphere that a simple worship session or service can bring to a home, as for the most part every person’s day is brightened by the end of a visit, and this reaps so many positive consequences. 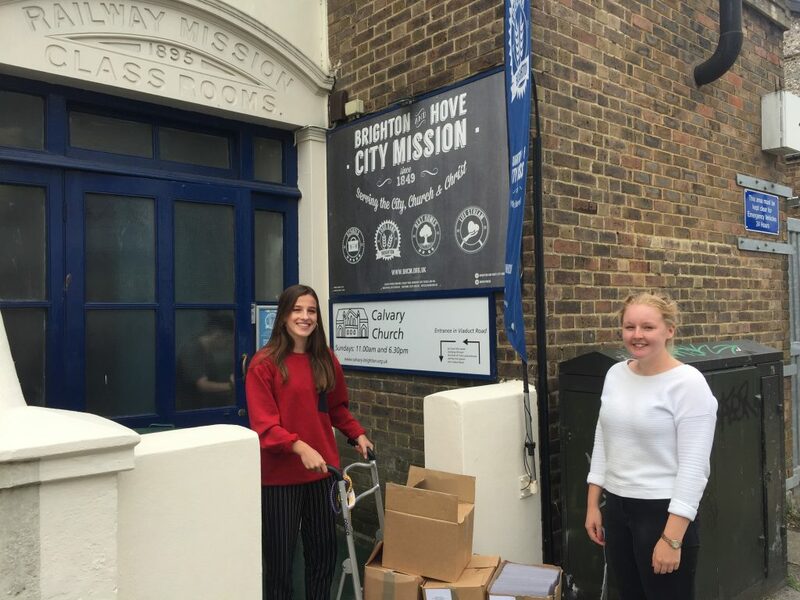 The third and final part of the City Mission entails the Food Bank Team, who are incidentally Brighton’s busiest food bank with over 500 clients using their services every year. In addition to creating food parcels, they also provide Home Start-Up Packs and the use of their Fuel Aid service and subsequently they cater for the needs of the most vulnerable and marginalised in Brighton. Due to the nature of their work, individuals who use their services often have complex needs such as addictions, homes of domestic abuse, homelessness or living in great poverty. As a result, clients are always offered or directed to other sources for spiritual and emotional support as well as physical support to create a system of holistic care. Despite not being a regular volunteer, I love coming down to the City Mission (I originally live in Haywards Heath) as and when I am available. It is a privilege to learn from the team and other volunteers, and throughout this time I have grown in confidence and experience in caring for the most vulnerable in our society. As a Christian, I am passionate about Social Justice, and the skills that I have learned from volunteering here will be used to a greater extent as part of my Gap Year and studying and living in London as of next year for University. Clearly I would be biased, but I would highly recommend supporting the City Mission through prayer, finances or time, and to join with them in their aspiration to reach the City for Christ. Bev, our Rest Homes Team Leader, has been on a journey with running. Many of her older friends have quite an active lifestyle, and seeing those guys as role models, she started thinking about what she could do. After seeing the health benefits of her husband taking up Parkrun, she felt inspired to join him. Building fitness, Bev started looking at more opportunities to run, and will be completing the 5k Parkrun on Hove seafront this weekend, looking for a personal best! 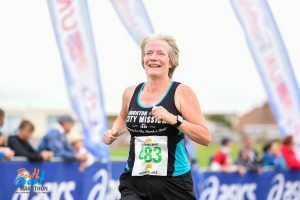 Bev will be running the Seaford 10k on the 3rd September, and will be raising money for the City Mission. If you could in anyway support Bev in her fantastic achevement please click here, thank you! The Schools team are currently delivering their summer ‘Change’ assembly. This theme is useful at the end of the school year when some children are moving on, or changing classes. 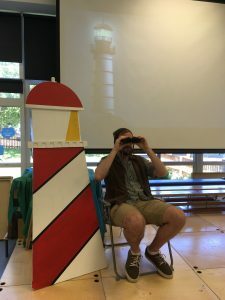 The assembly tells the story of a lighthouse keeper and how a lighthouse shines in the darkness, guides, and keep the boats on the water safe. Lloyd, as the lighthouse keeper sings a sea shanty about two boats out on the water, one big and one small. The big boat can see the lighthouse and is guided when the storms come. The little boat is in real danger, struggling to stay afloat, it can’t see the lighthouse, and is heading for the rocks. The big boat comes to the rescue and they both reach safety side by side, led by the shining lighthouse. The team then sing a song with actions about a lighthouse that guides us. The children are asked to think about people who could guide them and keep them safe as they move into a new class, or even a new school. The team share that as Christians, their ‘lighthouse’ is God, and he guides what they do. They suggest that the children might be a ‘lighthouse’ to those around them to help and encourage them, like the big ship in the story. The assembly has been well received and one Head Teacher said “Thank you for always bringing really helpful illustrations that we can use for further learning in school”.